Cool down your steppers : active or passing ? I never wanted the usual bulky fans all around my steppers, so I decided to try passive cooling first. This works beautifully without clobbering the printer. I used low cost 4x4 cm heat sinks from ebay (Got 5 of these for $7, eg. "Aluminium Heatsink for 3w or 5w High Power LED"). They are held in place with the excellent $7.50 "Thermal Adhesive Tape 3M Heatsink 100 x 100mm" again from ebay. It is a kind of double face sticker that you cut to your will. I added heat sinks only to the X/Y/E stepper motors, since the Z motor (bottom case of the ultimaker) will not get as hot as it is not moving a lot. Well, unless you use the Joris option on a big object, of course. I am not sure there is enough room also. IMO, you don't really need heat sinks for the steppers, they have plenty of torque, even if the stepper driver is dialed down to limit the current going into the steppers. I would suggest to dial down the stepper drivers first, before going through the trouble adding heat sinks. In fact I'm not really scared of the steppers getting hot. What bugged me is that they can get too hot for any PLA mount. Really, on long prints, they started to move in their holes by meting the PLA of my feeder. Also my picture is a bit misleading: I just had some spares around, so they went to the X/Y steppers also. Everyone can trust you when you say it is overkill. Still, it would be easier for me to add heat sinks this way than to play with the driver power, with the "risk" of missing steps or burning electronics... This setup gives me enough room so I do no more have to think about this. this is a very good solution. i also encountered this issue which i thought it was a nozzle clogged when it was in fact filament bucking due to heat transfer from the extuder (it only needed 50c to soften). will be getting these heatsinks fast. 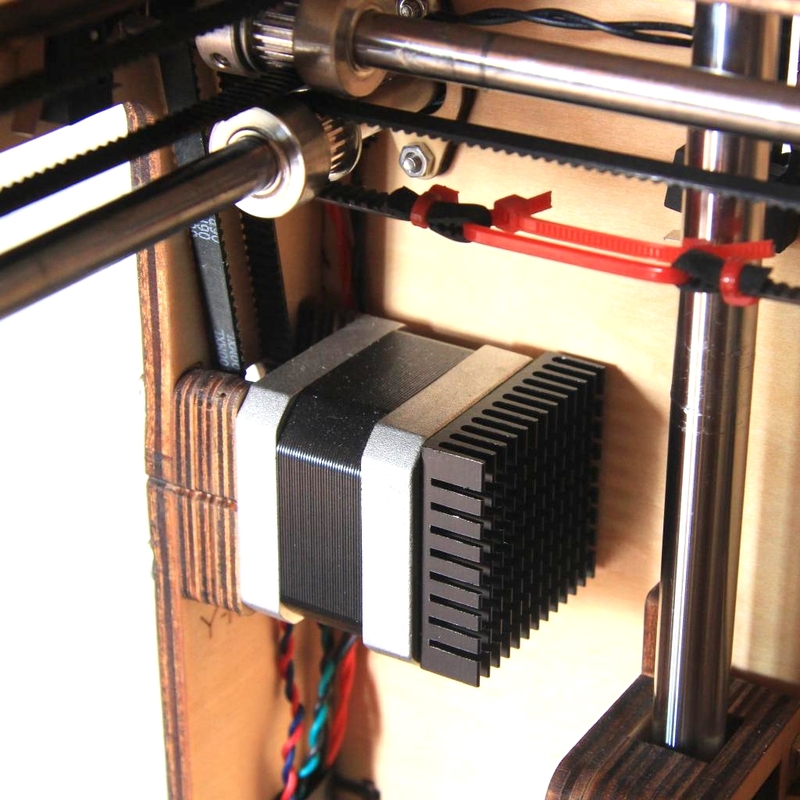 even already have plans to add in a fan to cool it further for very long prints.